This wallpaper job is in a corporate cafeteria where they wanted to make a statement about their business. It works! The design is by Eye for Design, and I think it’s terrific. 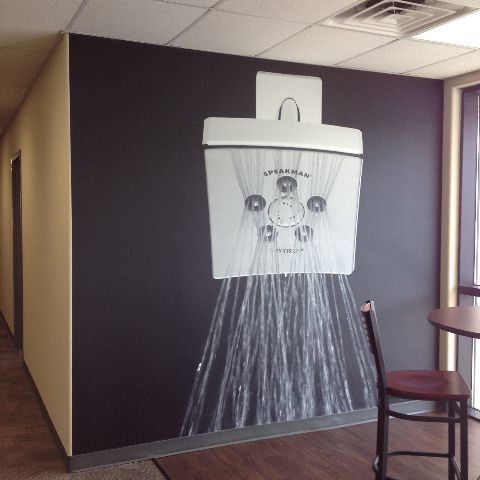 Custom Wall Murals are great whenever you want to set a mood, brand your business, or create a feeling. We’re doing a ton of it, and for good reason. Our commercial grade vinyl and UV cured inks give you an installation that is attractive and durable. Give it a try! This entry was posted in Custom Printed Wallpaper and tagged branding wallpaper, custom wallpaper, wall murals. Bookmark the permalink.